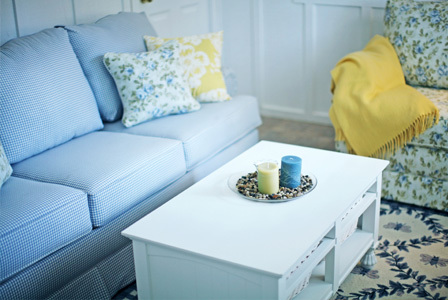 A much-loved and -used coffee table can look new again with some tricks that give it a facelift and add new life in the room! Coffee tables get a lot of use — and abuse, as one of the most functional pieces of furniture in a home. Rather than a costly replacement, give yours a facelift! Even scratched and marked coffee tables can become chic with a little do-it-yourself makeover. Strip off the old finish and slick on a coat of color! It gives the room an immediate pop and makes the coffee table look new again. Use a paint stripper to remove the original finish, sand and wipe down, then paint. Seal the new coat of paint with clear polyurethane. Make laser-print copies of art images or use photos, even postcards, from your travels. Experiment with the arrangement until it pleases you, then affix the pictures to the table with craft glue. Seal with two coats of clear varnish. You don’t have to strip old finish for this transformation — just incorporate it into the design! Sand the table with a rough grade of sandpaper, then add extra texture by roughing up the surface — scratching it and gouging with a screwdriver. Wipe down the surface to remove dust. Apply a light coat of latex paint and let it dry. Now rub the tabletop, legs and edges with a white candle so the wax randomly adheres. 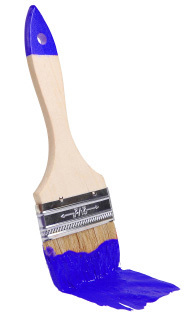 Apply a second coat of latex paint in a different color from the first. When dry, use a medium-weight sandpaper to gently sand off patches of paint to reveal the first color and some of the original finish. Choose a color you like and buy enough felt to cover the table top. Invert the table onto the felt to trace a pattern for cutting to size. Right the table and place felt on top, lining it up for a precise fit. Attach the felt to the table with decorative nails by pounding the nails through the felt into the outer edges of the table. Space the nails at even intervals. This works with leather, vinyl and fabric too! Scratched or cloudy glass-top table? Frost for a fresh look! A can of spray frost will cover up flaws. Create more visual interest by taping off stripes or using stencils for a pattern; the frosting won’t adhere to the covered areas. Use the spray outdoors for ventilation. Camouflage scratches and dings with a crackle finish. Latex paint applied over almost-dry oil-based paint produces an interesting crackle finish. So easy! Have a piece of mirror cut to fit your coffee-table top and adhere with a strong adhesive.